For confectioner Deena Branson, owner of Branson’s Chocolates in Ashland, there was always a dream that she would someday own and operate a successful small business, but it wasn’t until 2005 that she dared to imagine turning her passion for creating delectable chocolate confections into that business. Fast forward to 2018, when the talented and endlessly creative lifelong Ashland resident has a thriving wholesale and retail business, featuring only the best Belgian chocolate that goes into such mouth-watering treats as Anjou pear creams, lavender squares, wasabi ginger squares and blood orange creams, as well as your more standard treats like toffees and caramels. 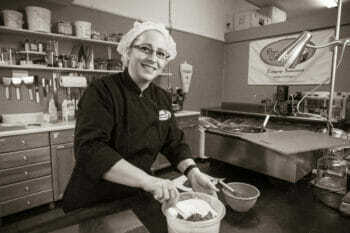 After spending ten years in the late 90’s and early aughts learning everything there was to know at the Ashland Fudge Company – she even trained two sets of new owners during that time Deena and her husband Kevin leapt at the chance to purchase the equipment and recipes when the company went out of business in 2005. Since that time, through dogged determination and countless hours of hard work, Branson’s Chocolates has steadily grown its business and burnished its reputation as Ashland’s only locally-owned, locally-produced chocolate business, culminating in the opening of their retail space in 2014. The early years of the business were spent working out of a production facility in a business complex, producing mostly for wholesale customers. Ashland’s Paddington Station and Grange Co-op were early supporters who sold not just the chocolates, but also the custom packaging that Deena created for each wholesale customer. Today’s customers include Butler Ford, the Ashland Springs Hotel, Anderson Auto Body and many others. In addition to making the chocolates, Deena’s ability to do custom molds and packaging has been a huge selling point for clients. Luckily, for the past five years, one hasn’t needed to be a wholesale client to enjoy the dazzling, mouthwatering array of treats that Deena, Kevin and their hard-working crew create. The retail location for Branson’s Chocolates is 1662 Siskiyou Boulevard in Ashland, and is open Monday through Saturday 10:00 AM – 5:30 PM. Visitors to the retail shop will be greeted with a selection of chocolates that is impressive not only in taste but in variety. The ever-popular toffees and caramels are always available, but adventurous types will also find port wine ganache squares, truffles flavored with tequila (lime, sea salt and Patrón tequila), pomegranate, espresso, toasted coconut porter, pumpkin, raspberry Chambord, amaretto and so much more. Product sourcing and quality are important considerations that go into all of Deena’s creations. Ten years ago, the owner of a local restaurant asked me to create a chocolate sauce that he could use with his espresso machine. 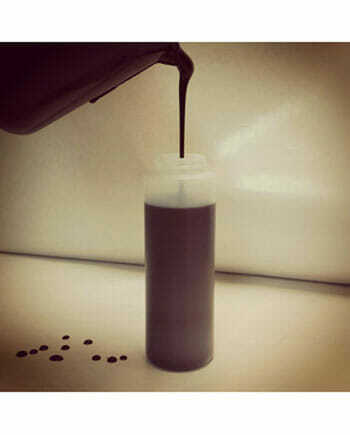 We have perfected our Chocolate Sauce recipe and now make it by the kettleful. We mix sugar, vanilla, and water with pure chocolate liquor–which is made by grinding the nib of the cocoa bean into a thick paste that melts when heated. Chocolate liquor contains no alcohol, as opposed to chocolate liqueur, which is alcohol with chocolate added to it. Chocolate Sauce is delicious on ice cream, fruit, waffles, and is perfect as a base for hot cocoa and chocolate milk. One of our customers even swears it’s best just eaten straight from the bottle. However you like it, and whatever you like it on, we have your Chocolate Sauce! March 9th-11th, Friday, Saturday, and Sunday, we will be at the Oregon Chocolate Festival at Ashland Hills Hotel & Suites. March 17th-18th, Saturday 11-5 and Sunday 11-4, we will be at the Oregon Cheese Festival at Rogue Creamery in Central Point. Easter is Sunday, April 1st this year. We are busy making chocolate treats, including everyone’s favorite bunnies, so stop in, get your favorites, and fill your baskets. We’re at 1662 Siskiyou Boulevard, just a block south of 7-11, in the Minute Market shopping center. We’re open Monday-Saturday 10-5:30. 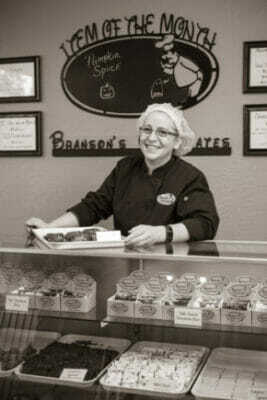 Locally owned and locally produced Branson’s Chocolates is located at 1662 Siskiyou Boulevard in Ashland. Owned by Deena and Kevin Branson, the boutique chocolate factory has steadily grown over the past 12 years and is now processing more than 1000 lbs of chocolate per month. With Valentine’s Day just around the corner, Branson’s Chocolates has been busy stocking up and getting ready for the holiday rush. In our interview today we speak with Deena to talk about some of her favorite creations and her plans for 2018. Deena, thanks and welcome back to Locals Guide. We always enjoy your monthly business column in which you share your latest and greatest creations. Thank you, and thank you to all our readers… Having the column helps to keep us pushing to create new chocolates, and we also get to showcase our favorites. Just to bring things into context, exactly how much is 1000 lbs of chocolate per month? When we moved to our current location we were bringing in about 250 lbs per month, now we are at about 1000—we’ve quadrupled our chocolate production in less than three years. Let’s just say that 12,000 lbs is roughly equivalent to a full size elephant. Deena catch us up on how the year went year for Branson’s. It has been a crazy good year. We decided to take another leap of faith, the third big leap of faith we have taken. The first was to move the business and open retail, the second to expand our location and take over the adjoining section of the building. This time we decided that Kevin (my husband) would retire from his job of over 28 years and come work with me. He has spent the last couple of months learning the systems and getting familiar with the day to day operations at Branson’s Chocolates. Over the past 12 years he has helped with all the events we go to and has spent plenty of his vacation days helping me. What have been some of the local favorites this year? 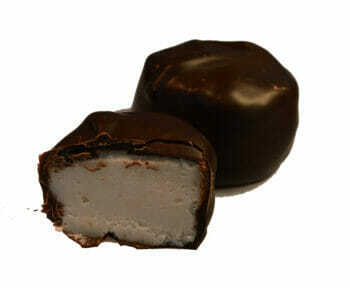 Our Marzipan Creams have been a favorite right from the beginning. 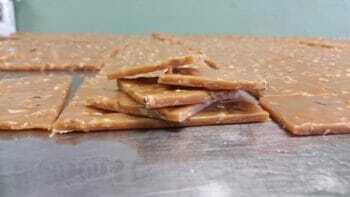 The have the wonderful almond flavor that the traditional Marzipan has. But ours is different than most it is smooth and creamy like a cream and that is why we call it a Marzipan Cream. Deena, on top of running a chocolate factory you also have a retail space. Yes, we are continually putting the word out about our retail store. We are located at 1662 Siskiyou Boulevard (the old Mongolian Grill). This is where you can get our rotating Item of the Month, Oops!’s (discounted, visually imperfect) products, and all the other goodies that we make. We have quite a few places where you can purchase a variety of our product, but our retail store is the only place you can see everything we make. Tell us about some interesting projects you have been involved in recently. 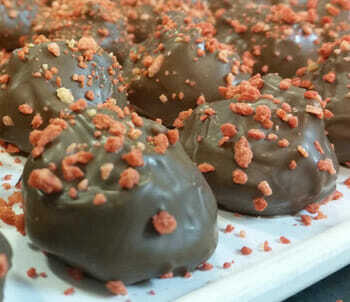 Last March I taught a Truffle Making class in conjunction with the Oregon Chocolate Festival. It was my second time to teach a class, but my first truffle class. Every attendee left with a recipe, a set of dipping forks, and truffles that they got to personally dip, so they could go home and make their own truffles. 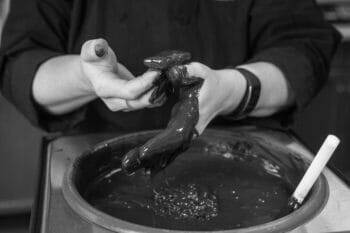 I will be teaching another Truffle Making class this year, in conjunction with the Oregon Chocolate Festival March 10-11, 2018. Deena, please tell us about some of your treasured recipes. When we started, we purchase the equipment and recipes from Ashland Fudge Co. The recipes we use for creams, caramels, and truffles are based off of those original recipes. The fudge recipes that we use originated in the late 1800’s on Mackinac Island, Michigan. And we have the recipes that I have created on my own. You recently completed a successful internship with a local high school student? Yes, I had a student from North Medford High School doing her senior project with me. North Medford requires that the student do their senior project in the area of field they want to go into and they have to volunteer between 20 and 40 hours. When this student asked if she could do her project with me, my requirement was that she create a product that we could sell, a product that we could potentially make a regular item. She did, and came up with December’s Item of the Month, Port Ganache Square. Please tell us about your store’s hours and opportunities for the general public to come and visit. We are open Monday – Saturday 10-5:30pm and closed Sundays. When you walk in, you can see right over the retail counter to the production area, and watch everything being made. There is no wall between the production and the retail areas so we can work and interact with the customers. Our packaging room has huge windows, so you can see how we hand wrap and label all the chocolates bars. Deena, please tell us about the array of custom products you make. There are several ways we customize chocolate for our customers. One is with custom flavors like our very first chocolate bar, Marion Blackberry Dark Chocolate Bar, which was requested by Ashland Springs Hotel. The Lavender Sea Salt Caramels and Salted Lavender chocolate bars for the English Lavender Farm use their lavender oil, and we make chocolates with essential oils for Blue Giraffe, to name a few. Another way to customize our products is with a custom label like we do for Paddington Station and Grange Co-Op. We can add a customer’s logo, picture, or artwork to our labels. Custom molded chocolate is another way to customize chocolates. You can have a chocolate mold made with your logo or artwork. 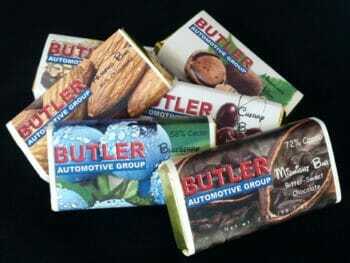 We do custom molded chocolate for Butler Automotive Group and the Holly Theatre. Product sourcing and quality are an important consideration that goes into all of your creations. Yes, it is very important to us. We source locally, and directly from farmers and distillers whenever possible. For example, our macadamia nuts and hazelnuts come directly from the farmers. Our mint oil comes directly from a farmer up in Clatskanie, Oregon. I choose Oregon-produced products and liquors over nationally-produced products. I believe in using the best, and supporting local businesses. Deena, are there any last thoughts or comments you would like to share with our readers? February’s Item of the Month is all about Valentine’s Day, Raspberries and Strawberries. We will be featuring our Raspberry Chambord Truffles, Raspberry and Strawberry Creams and a couple brand new items, a Raspberry Dark Chocolate Bar and a Strawberries and Cream White Chocolate Bar. 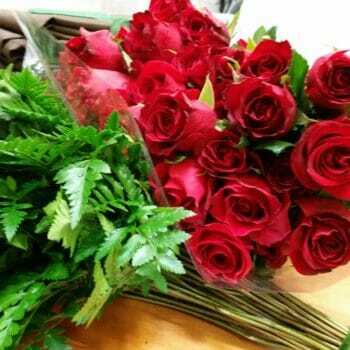 We will be doing our Valentine’s Day Special again this year of a free Red Rose with the purchase of Valentine’s Box of Truffles. The Valentine’s Day Special starts February 12th while supplies last. Hazelnut Toffee–those words instantly conjure up Oregon deliciousness and chocolate delight, all in two little words. At Branson’s Chocolates we love our toffee, so we dressed it up with Oregon-grown hazelnuts for a tasty start to the New Year. We melt rich creamy butter in a giant copper pot, sweeten it up with cane sugar, and let them cook together for a while. Then we add the hazelnuts and let the flavors blend before pouring it all out on our cooling table where it is cut into squares. While the toffee cools, we temper some of our Semi-Sweet Chocolate and hand-dip each toffee piece, followed by a generous sprinkle of chopped hazelnuts, just for you. Branson’s Chocolates, your home of Hazelnut Toffee Squares and all chocolate deliciousness, is right here in Ashland at 1662 Siskiyou Boulevard. We’re just a block south of 7-11, in the Minute Market shopping center. We won’t be out and about in January, so come visit us in our store and get some Hazelnut Toffee Squares while they’re here. We’re open Monday-Friday 10-6, and Saturday 11-5. 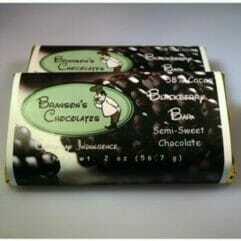 Branson’s Chocolates is debuting a new chocolate just in time for the holidays—Port Ganache Squares. We start with our delicious semi-sweet chocolate and local cream, stir in a heavy drizzle of Port, let it set, and then dip it all over again in that rich semi-sweet chocolate that you love. Can you say gourmet? Fun fact about Port—the name Port is derived from the city of Porto, Portugal, where for centuries merchant ships loaded with casks of Port began their journey up the coastline to England. Port is a fortified wine, because brandy is added during fermentation, which helped sustain the fragile wine during its voyage to England, and also made the wine considerably sweeter. Port is known to pair well with decadent desserts, which makes it a perfect match for our chocolate! The idea for Port Ganache Squares came from our newest intern, Tori. Tori is only a junior in high school, but is working with us for her senior project because she plans on graduating a year early—talk about hard work paying off! The 4th Annual Christmas Showcase December 1st-3rd at the Jackson County Expo in Central Point. It’s the region’s largest holiday gift and craft show with over 190 vendors. We will be there Friday & Saturday 10am-6pm, and Sunday 10am-4pm. The rest of the month we will be right here at our store to fill your all holiday wish lists, your must-impress gift needs, and your own candy bowls and secret stashes. We’re at 1662 Siskiyou Boulevard, just a block south of 7-11, in the Minute Market shopping center. We’re open Monday-Friday 10-6, and Saturday 11-5. Pumpkin Spice flavor isn’t just a new trend. “’History shows that pumpkin spice-like combinations have been used for millennia in various cultures,’ said Kantha Shelke, a scientist at Corvus Blue, a Chicago-based food science and research firm and an adjunct professor of regulatory science and food safety at Johns Hopkins University. ‘For instance, similar mixtures of spices are used in Indian masala chai and Middle Eastern baklava.’ Shelke notes that ‘spices are powerhouses of phytochemicals — chemicals that the plant makes to protect itself — that can afford us health and protection from many health issues.’” Here’s to Pumpkin Spice, and everything nice! Make Branson’s Chocolates your ultimate gift shop–we have something for everyone! 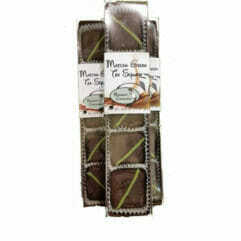 We have creamy Milk Chocolate, sweet White Chocolate, and of course dark luscious Semi-Sweet Chocolate. We have traditional chocolates, table-creamed fudges, gourmet chocolates, and chocolate bars. We have nuts, we have caramels, we have crèmes, we have chocolate with fruit, and even chocolate with espresso if you want a little kick. We even have caramels without chocolate, just in case. 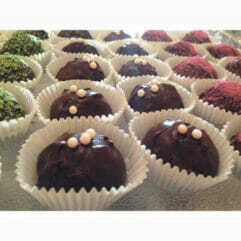 If you want something for a chocolate connoisseur, of course we have Truffles, but we don’t stop there. In our Gourmet Chocolate line we have Macha Squares, Earl Gray Tea Squares, Jasmine Squares, Lavender Squares, and Wasabi Ginger Squares. Wait, that’s not all, we also have Gourmet Caramels—Sea Salt, Smoked Salt, and if you’re feeling a little adventurous try our Whiskey Caramel. Our Truffles come in gift boxes of 4, 5, 6, 9, and 12. Gourmet Chocolates are in boxes or 2 or 5. 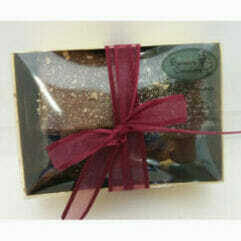 Our traditional chocolates can be boxed in ½ pound or 1 pound boxes. 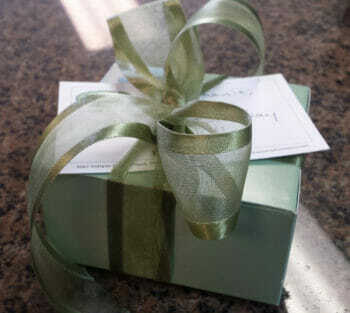 All our boxes can tied with pretty bows ready to give. With a minimum order, we can customize the label on any flavor of our Chocolate Bars with your name, your logo, your business, and even your photo, making our Chocolate Bars gift-ready, just for you. Branson’s Chocolates, your gift giving paradise. Right here in Ashland at 1662 Siskiyou Boulevard, M-F 10-6, Sat 11-5. 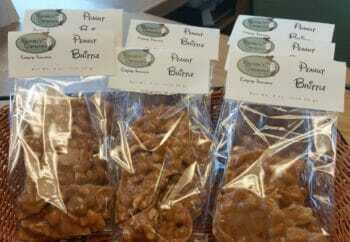 The delicious finishing touch for any business, any occasion, any event! 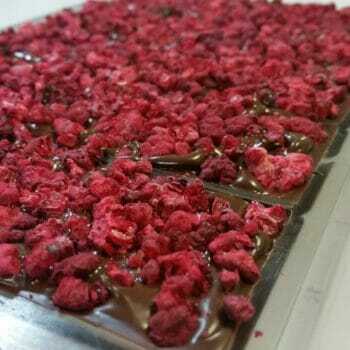 Let us customize our delicious chocolate for you. Custom labels can be created from your business logo, your motto, your event, your photograph, even your name, just about anything that will fit on a label. 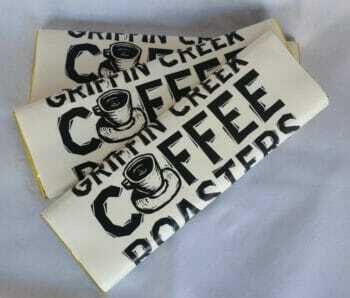 We custom label chocolate bars for many local businesses. In fact, if you’ve had chocolate at Paddington Station, Paddington Station’s Inspired By Oregon, The Paddington Jewel Box, all nine locations of The Grange Co-Op, Tudor Guild Gift Shop, Craterian Theater, Camalot Theatre, Holly Theatre, The English Lavender Farm, Sew Creative, Griffin Creek Coffee Roasting, Kriselle Cellars, Schmidt Family Vineyards, Paschal Winery and Vineyard, or Weisinger Family Winery, you’ve probably had Branson’s Chocolates without even realizing it. Many businesses including Abigail’s Bed and Breakfast, Bayberry Inn Bed and Breakfast, The Iris Inn B&B, McCall House Bed and Breakfast, AmeriTitle Inc., Highbanks Machining, Siskiyou Endodontics, and Larry Steiner at Edward Jones Investments use our custom labeled chocolate for Thank You Gifts. 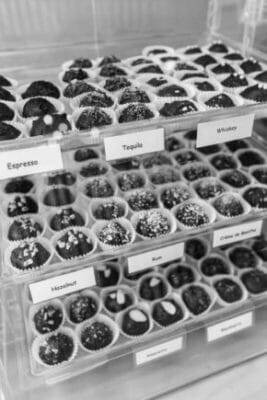 We create custom labeled chocolate for events such as weddings, showers, races, fundraisers, corporate meetings, grand openings, promotions, company dinners–anything you want to be remembered. We can create Custom Molded Chocolate in almost any size bar or square, with your name or logo. Just ask Butler Automotive Group, Acorn Consulting Services Inc., Ashland’s Main Street Inn, or The Blue Giraffe. If you want to talk about customizing Branson’s Chocolates for your business or event, stop by our store at 1662 Siskiyou Boulevard here in Ashland, M-F 10-6, Sat 11-5, except August 27th we will be at The 3rd Annual Benefit Car Show at Phoenix’s Petro Truck Stop/Iron Skillet Restaurant , 10am-4pm. 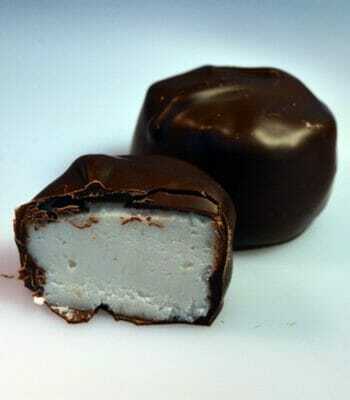 Marzipan Creams are our Item of the Month at Branson’s Chocolates in July. Marzipan is a sweet paste made of finely ground almonds and sugar or honey, and often flavored with vanilla, cinnamon, nutmeg, orange, or lemon. It is a traditional European treat eaten like candy, often molded into fruit shapes, sometimes dipped in chocolate. Our Marzipan Creams start with our classic cream recipe, stir in almond paste, and then dip it all in our delicious rich semi-sweet chocolate. Across the world, Marzipan has many variations. In Latin America, the almonds are replaced by peanuts, and they call it Mazapan. In Mexico, pine nuts and pistachios are substituted for the almonds. In the Middle East, Marzipan is usually flavored with orange-flower water. Marzipan treats have an ancient history. Legend has it that during a 15th century famine when flour became scarce, bakers created a replacement using eggs, sugar, and stores of almonds.In Germany and throughout much of northern Europe it is considered good luck to receive a Marzipan pig on Christmas or New Year’s Day. Marzipan is a traditional food to eat on weddings and religious feast days in Italy, Greece, and Cyprus. But don’t think that Marzipan is only for European history buffs with a sweet tooth. People everywhere love Marzipan so much that it has its very own holiday—January 12th is National Marzipan Day.Marzipan is even the name of a character in the Nutcracker ballet. How sweet is that? We won’t be out and about in July, so come see us in the store at 1662 Siskiyou Boulevard here in Ashland. We’re just a block south of 7-11, in the Minute Market shopping center. We’re open Monday-Friday 10-6, and Saturday 11-5. If you’re lucky, youmight even catch us dipping and pouring chocolate! We will be closed on July 4th, come join us in celebrating our nation’s independence. Ashland puts on quite a party for the Fourth of July, starting with a hometown parade and ending with a fantastic fireworks display. Happy Fourth of July to you!